The impact of Hurricane Harvey on parts of Texas has been devastating. 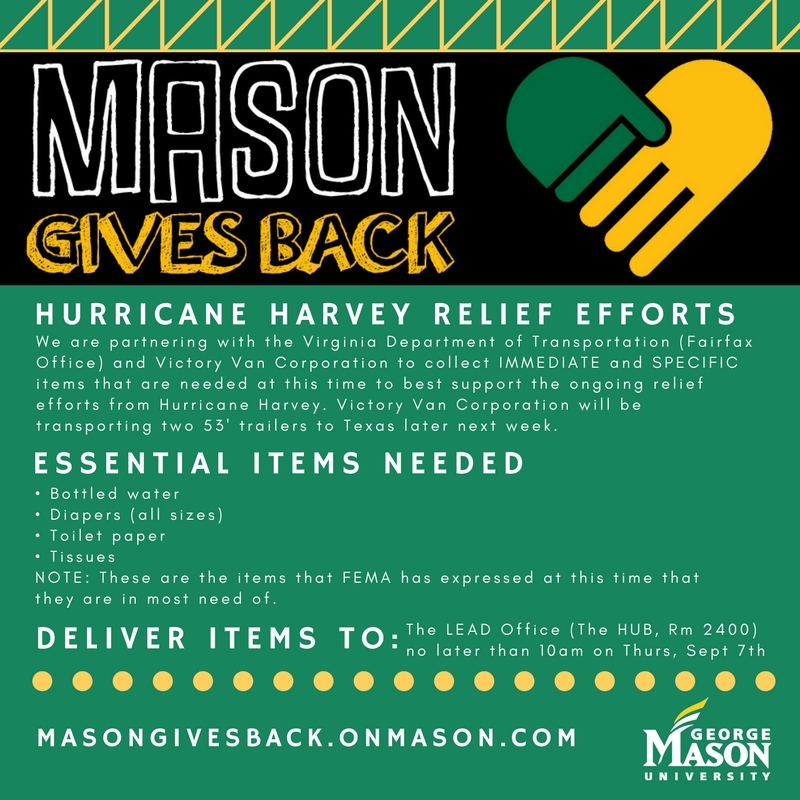 For those in the Mason community who wish to contribute to relief efforts, several resources are listed below. We also have several students from the Texas area whose families have been impacted by Hurricane Harvey. As we receive more information from those students and their families, we will update this page. Mason is partnering with the Virginia Department of Transportation (Fairfax Office) and Victory Van Corporations to respond to some immediate needs of those most affected. The Center for Disaster Philanthropy has also launched a Hurricane Harvey relief fund. The organization says its strategy emphasizes “investing well rather than investing quickly, addressing the greatest needs and gaps in funding that may be yet to emerge. Help a Children’s Hospital which cares for Corpus Christi’s youngest and most ill patients, was directly in the path of Harvey. The hospital transported many of its patients out of harm’s way, but will likely will need funds to seamlessly continue operating its 189-bed pediatric facility. Donations can be made online at www.driscollchildrens.org. Samaritan’s Purse is accepting donations as well as volunteers for Harvey disaster relief for the coming months. Animal Defense League of Texas: Used or new towels, flat sheets, non-scented baby wipes, blankets, crates, and pop-up kennels are just some of the needs listed by the Animal Defense League of Texas on their Amazon wish list. According to their website, the shelter plans to help provide for animal shelters in Hurricane Harvey’s path. Refugee Services of Texas-Houston: A list of supplies needed by this charity, which provides resettlement services to refugees and other displaced persons in the Houston area, can be found on their Amazon wish list. Texas Diaper Bank: “Please consider purchasing items off of our wishlist to send to those that are being effected by Hurricane Harvey,” the charity wrote in a Facebook post. “Every diaper and every wipe counts.” A complete list of items needed by the Texas Diaper Bank can be found on their Amazon wish list. American Red Cross: The American Red Cross has designated items, such as portable cribs and power outlets, needed for relief efforts on an Amazon wish list specific to Hurricane Harvey. Junior League of New Orleans Diaper Bank. The Junior League of New Orleans will be helping Hurricane Harvey victims through accepting donations to their own diaper bank. “Many agencies will be providing aid, and JLNO is uniquely positioned to help families through its Diaper Bank,” the agency wrote in a Facebook post.“We are accepting donations of diapers, baby wipes, diaper cream, and feminine products.” A complete list of the needs of this charity can be found on their Amazon wish list. Shop with Amazon Smile: By choosing a charity, such as the Red Cross, through Amazon Smile, a portion of all everyday purchases made on Amazon will be donated to a chosen organization. Coalition for the Homeless of Houston/Harris County coordinates the city’s response to homelessness, serving as “a backbone organization” to groups that offer direct service. It has been providing updated information on shelters with available beds. Here is its list of food banks in Texas likely to be affected by Harvey: Houston Food Bank, Galveston Food Bank, Food Bank of the Golden Crescent (Victoria), Corpus Christi Food Bank, Southeast Texas Food Bank (Beaumont), Food Bank of the Rio Grande Valley (Pharr), Brazos Valley, Food Bank (Bryan), Central Texas Food Bank (Austin) and San Antonio Food Bank. Austin Pets Alive! says it has transported more than 235 animals to its shelter. The organization seeks donations, as well as people who can adopt animals. It says it has received so many donated supplies that it’s running out of storage space, so financial donations are what it needs most.